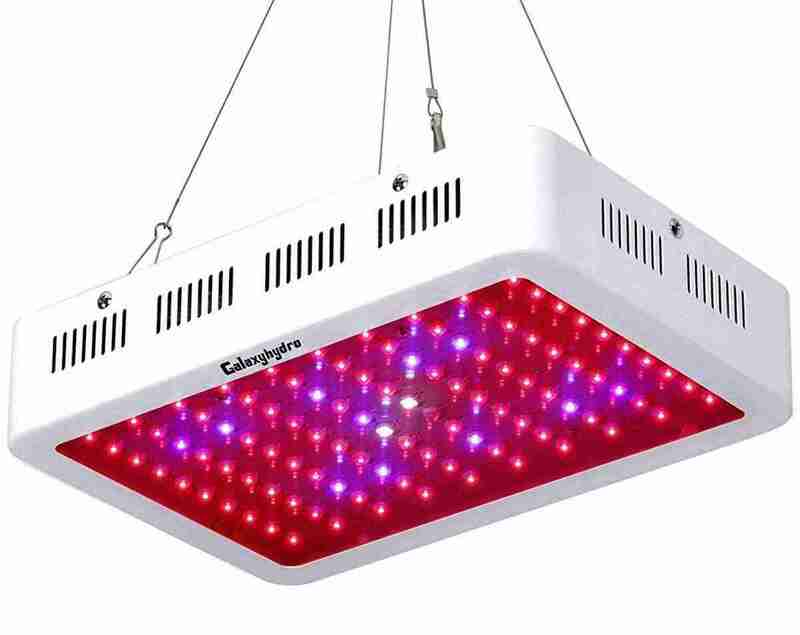 In this Roleadro LED Grow Light, Galaxyhydro Series 1000W LED grow light review article I am going to tell you all about its features and performance. I own an indoor garden where I mostly cultivate sleepy-yuda for my research and random vegetables during winter. 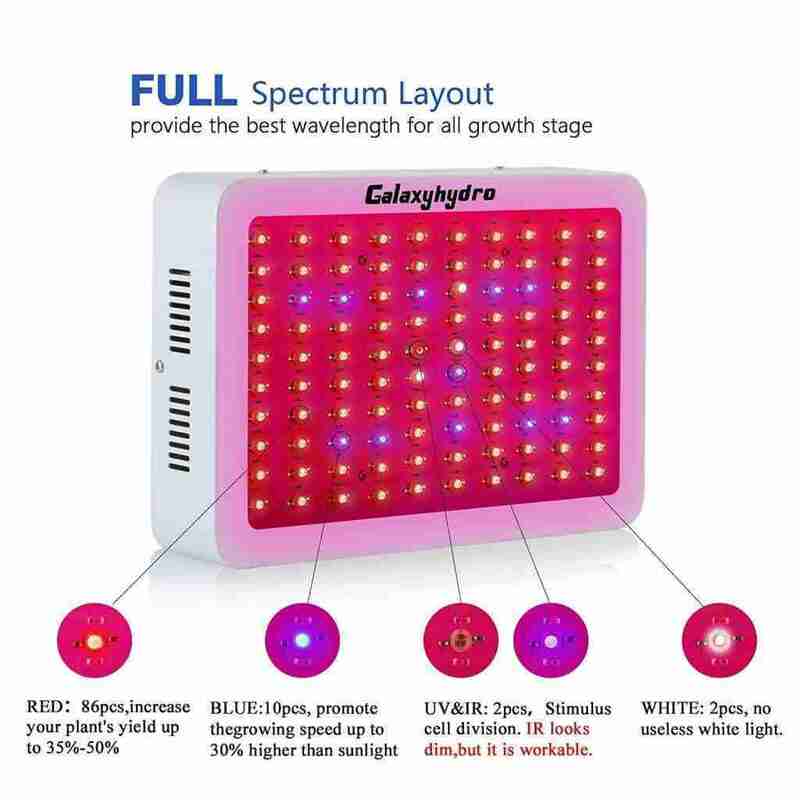 Recently my old grow lights wear out, and I got this Galaxyhydro series 1000w LED grow light after doing some research. I choose it because it had the power that I was looking for, affordable and that time I was not doing my lab research. So instead of making a spreadsheet, I had time to observe the product and made some research on it. So, without delay further, here is my experience during the 20 days of the test. How high should I hang the light in a 3/6 ft area? Does the panel come with on/off switch? Is the panel UL listed? Where are the diodes made from? How many lumens offers the light? 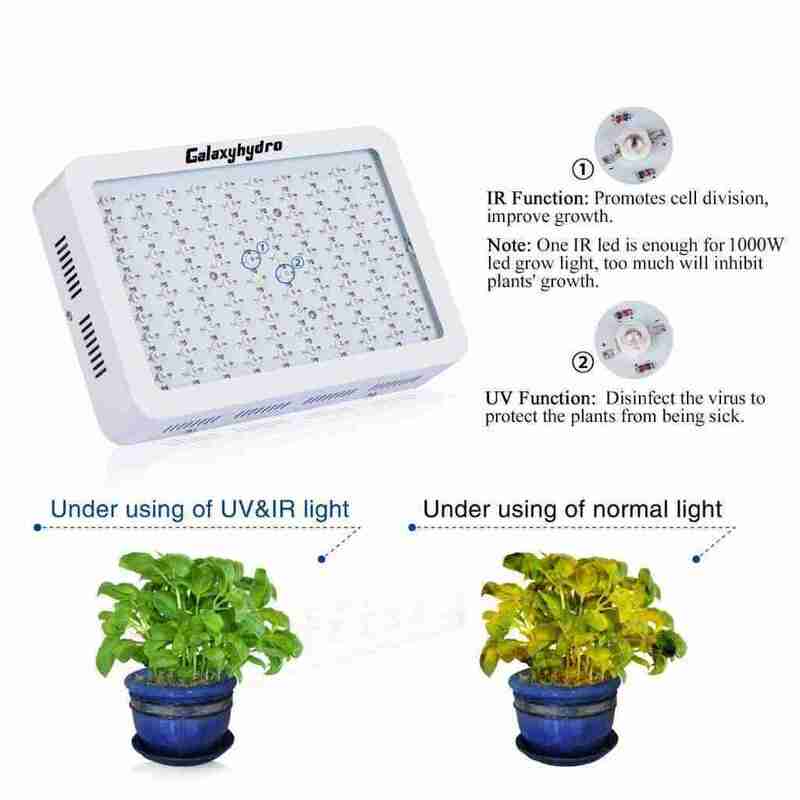 The grow light offers full spectrum including Blue, Red, UV, IR and the warm white light. This white light produces heat which produces heat that keeps the tent warmer in winter. These are work to grow plants’ cell, increase defense system and all. 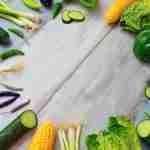 So, from seeding to growing flowers or fruits, these rays are essential. But its duration and ratio of the spectrums that works most in cultivation sector. I like the packaging though. The packet was sparkling clean and well packed. All the attachments like power cord, hooks, etc. are well-built and packet separately. The light is sturdy, well-made but not unnecessarily bulky like the MARS II grow light. 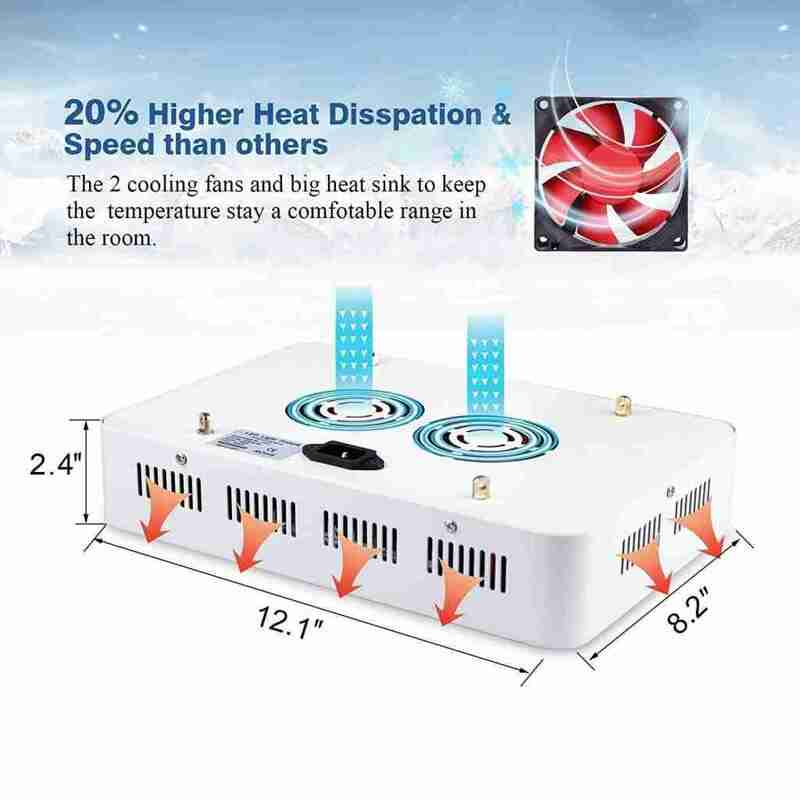 This is the second-generation LED light, and it has fine heatsink, quality cooling fans, electrical connections. The best thing about the light panel I think is high-quality diodes and lenses. I had used more than six different brands of LED grow light. Many of them turned could burn or discolor after few uses. But Releadro was not like that. It was wonderful from start to finish. It’s because they use a mix of 90 and 12-degree quality lenses, so the light footprint is wow! The 1000w light offers 453 PAR at 18”. You can use it any growing environment like cold, warm or temperate. The light shows a better flow for my strawberry plants. But these plants were already at the point of blooming. However, the blooming and fruiting period was as I expected but this time, got more yield then I usually do. The strawberry was growing fast and came excellent big shape. I think it has better than last time with my MARS II. Now time to talk about the lettuce I planted. The plants were not so happy that they usually do. I mean I planted parsley and lettuce before. These are easy to grow. The high PAR may be worked little harsh for the plants. That is why it is to minimize the light time as I see they started the growth. And it worked. I wish there were dimmer to control the light for certain types of plants. I was OK with my old style red-blue diodes. They would cover almost all the plant growing spectrums. 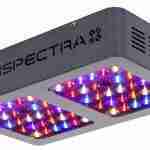 When I start with Grow tent kits for beginners my first buy was Viparspectra 300w LED Grow Light. It was great for my mini indoor garden which was 3/2 ft tent. Later I add one more until I had a bigger tent along with the complete indoor hydroponic grow system or in short the complete hydroponic grow kits. That time I changed the light setting and go for more wattage. However, this second-generation LED from Roleadro has every did with full spectrum. With the white light, it covers everything it needs to maintain well cultivation. You can actually use it for commercial farming. Depending on the room size or tent size you may need multiple panels. In primary case, my fruits (strawberry) and vegetable (lettuce) were overall great at the end. Now it’s time to talk about is technical features. Let’s what we got here. Ideal for small indoor gardening. Includes full spectrum so, the plant growth increases better than sodium lights. Comes with two high-speed fans to keep the system fresh. Covers more area compare than its size and capacity. Comes with 30 months of warranty. Does not come with daisy chain cable. No on-off button or dimmer. Eighteen inches above would be good. In China and the Epileds chips that the light use which manufactured in Taiwan. The description says 5000 lumens. In this Roleadro LED Grow Light, Galaxyhydro 1000W LED Grow Lights Review I shared my experience with you guys to make a picture that you can understand. It has many right sides but of course, there were some lacking. Features like a timer, dimmer and basic on/off switch that other models are offering currency- was missing. These are very important especially when you are using light regularly. However, still, it’s a simple hassle-free growing light and good for those who want affordable non-complicated grow lights. All the parts assemble, and you get for hanging hook and one hook for daisy chain or D-chain. Your indoor grow kit or expand tent kit should include these stuffs— all you need to get the chain or wire hang it that is all. So, I hope you like the Galaxyhydro 1000W LED Grow Lights Review. If you do, go to the link given above to know more about it. Till then happy gardening!